Twenty-four students at NCC will be Ambassadors for the College after the launch of the aspiration raising Young Leaders programme. The exciting new initiative will also see the Young Leaders represent the student community, make a difference to aspects of College life and inspire others to better themselves. Through the programme, students will identify and refine their leadership skills, discover what it takes to be an effective communicator and a top leader and develop their presentation skills. Students will also be pushed outside of their comfort zone to explore a broad range of topics in order to build their confidence and focus on their future aspirations. 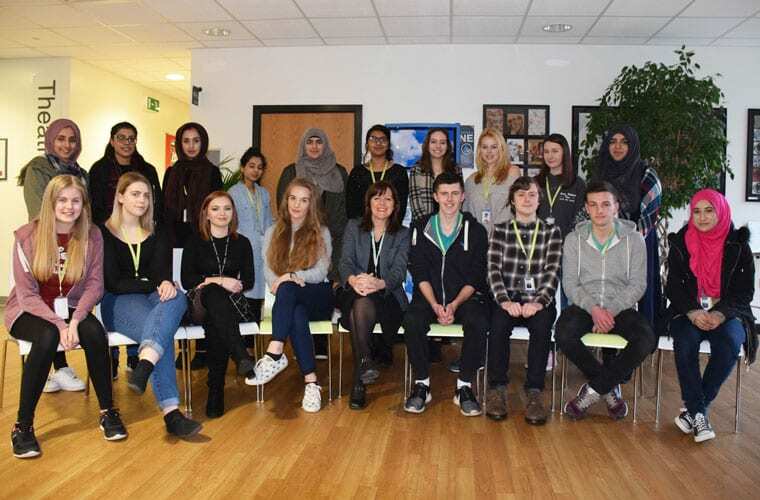 Each student underwent an interview process to be selected and the programme was launched with a speech by Principal of Nelson and Colne College Amanda Melton. Vocational Engineering student Alex Williams, 19, from Clitheroe, said: “It’s a great opportunity. I was surprised to be picked but it’s a good feeling. Mia Flynn, 17, from Burnley, who is studying English Literature, Philosophy and Politics at A Level, said: “I’m really pleased and it’s going to help my presentation and communication skills. Maleehah Tariq, 17, from Nelson, who is studying Biology, Psychology and Sociology at A Level, added: “I think the programme is a good way to meet new people and talking to different people makes you more confident. It is also a good thing to be able to put on my personal statement. “I want to study Audiology at the University of Manchester or the University of Leeds and to become and an audiologist in the NHS. NCC is continually developing the way curriculum is delivered in College and provides students with a range of enrichment opportunities throughout the academic year. The College is number one in Lancashire for student satisfaction, according to a recent FE Choices Learner Satisfaction Survey, and the latest government data places NCC as top in the county for A Levels, based on progress scores, measured against colleges who entered more than 100 students into exams. Principal Amanda Melton said: “Leadership plays a huge part in all aspects of life; social, business, professional, even at home.